Erica Kane, Founder of CheekyChicago.com, is a Jewtalian who loves to cook. View all recipes here. Erica Kane posts an ongoing and ever-growing collection of her favorite home cooked recipes. Using a mixer with a dough hook, add yeast and warm water (I zap it in the microwave for 30-60 seconds). Do not mix, just let the yeast foam for about five minutes. Add olive oil, honey and salt, then turn on mixer. Gradually add in flour until well mixed. Transfer to a bowl that you’ve already drizzled and lined with olive oil. Allow to sit in a quiet, dry place for at least an hour (yeast literally has a mind of its own and needs peace and quiet to rise). Divide into two equal pieces. You can make both (one pizza simply isn’t enough for us) or freeze one for next time. In a medium pan or skillet, sauté garlic in olive oil until fragrant (just a few minutes). Add crushed red pepper, oregano and tomato paste and stir until tomato paste thins a bit in the pan and everything integrates. Add tomatoes, breaking them up as they cook. Boil just for a minute and remove from heat. Preheat oven to 525 degrees. When ready to assemble the pizza, heat a cast iron skillet on the stove. While the skillet and the oven are pre-heating, roll out the dough. When skillet is heated, before you put the dough in, sprinkle the bottom with 1 Tbsp. cornmeal, 2 tsp. sugar and 2 tsp. flour so the pizza doesn’t stick. Add dough to skillet, top with sauce and allow to bubble for a minute. Then add cheese and toppings and transfer to the oven. 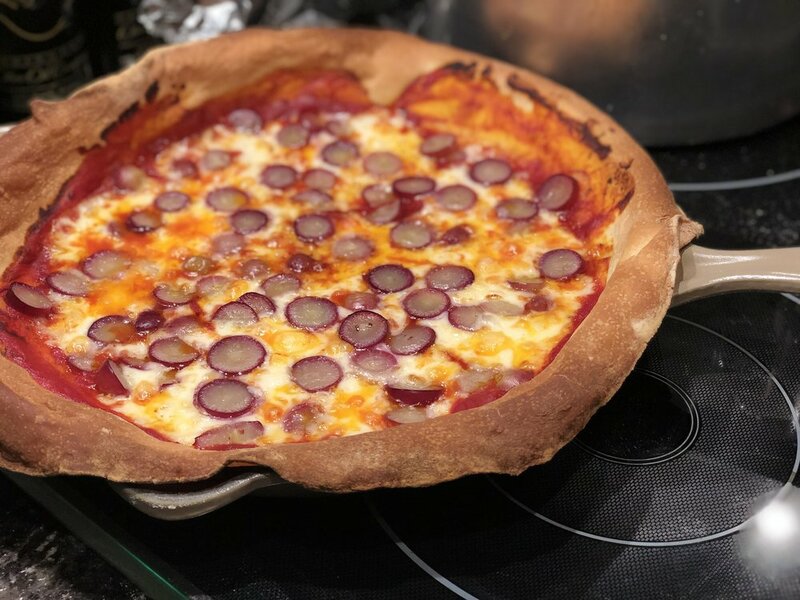 Cook for about 12-18 minutes (depending on your oven) - pizza is done when the cheese is melted and bubbly and the dough is brown on the sides. Once removed, allow pizza to sit for a few minutes and serve! As you shlep all over this site, please feel free to use the “search” bar below (look for fish, lasagna, appetizers, matzoh balls or sweets, for example) to make your perusing easier and more enjoyable. Oy vey, we have something to say! Sign up with your email address to receive news and updates. The Jewtalian is your go-to spot for recipes for the home chef, cooked up by Erica Bethe LEvin, founder of CheekyChicago. The website features Italian, Jewish, gluten-free, Mexican, Asian and Southern recipes, along with local restaurant reviews and recommendations and a blog. Consider the Jewtalian your newest lifestyle destination.